This edited article about mini-submarines originally appeared in Look and Learn issue number 761 published on 14th August 1975. It was a routine job. Pisces III, a tiny submarine with just enough room for its crew of two, was working on the sea bed at a depth of about half a mile. Pisces was burying a newly laid transatlantic cable. Its manipulator arms held a nozzle which directed a powerful jet of water that cut a trench in the sea bed. When the trench was formed, the cable sank into it. In time, it would be filled in with seabed material. Eight hours passed. Then the two pilots in Pisces III brought their craft to the surface to the mother ship, Vickers Voyager. As the Voyager began winching in the sub, waves lashed at the towline, which was momentarily slack. They snaked it around the hatch lock of the sub’s rear buoyancy sphere, pulling off the hatch cover. More than a ton of water cascaded into the sphere. Its weight snapped the towline, and Pisces III dived into the depths, hitting the bottom at 1,575 ft. (about 470 metres). This happened on 29th August, 1973, when Pisces was operating some 150 miles (240 km) off Cork, Ireland, and for 76 hours the two pilots crouched in their little craft, becoming progressively weakened by their diminishing oxygen supply. Then came a dramatic rescue by two other mini-subs, including Pisces II, an un-manned surface-controlled recovery vehicle named CURV III, made available by the U.S. Navy, and two support ships. Vital in making the rescue effective were toggles. These are devices with two arms that open and close like an umbrella. These were taken to the sunken sub by Pisces II and CURV III. With their manipulator arms, the rescue vehicles put these toggles through the open hatch of Pisces III’s flooded compartment. Once inside, the toggles’ arms were opened and locked in position. Slowly, Pisces III rose to the surface, hanging from lines attached to a support ship on the surface. The hatch was opened, and straight from Pisces into the mother ship went the two crew men, Roger Chapman and Roger Mallinson, whose hearts must have been full of thankfulness for their timely rescue. Although this drama is far from typical of the daily work of miniature subs, it does pinpoint the dangers faced by the crews. A big demand for commercial subs like these has been created by the search for oil and gas under the North Sea. A fleet of subs has been at work there, and others are operating in the Mediterranean, Caribbean and the Gulf of Mexico. A British company, Vickers Oceanics, has the largest fleet of commercial submersibles, as these subs are known. It has nine subs and five support ships. Out in the oil fields, these subs have many jobs to do. Surveys for the siting of new pipelines and the positioning of underwater structures are made in them. They are used to inspect and maintain rig structures, pipelines and well-heads. They find and recover lost equipment, and make video tape and photographic records of the condition of the underwater parts of the drilling platforms. To increase their versatility, manipulators are fixed to some subs. These are mechanical arms that can have a variety of tools attached to them for such jobs as gripping, cutting, sawing, drilling and pumping. These tools can be changed while the sub remains underwater. Naturally, these subs have many advantages over human divers. They can go a lot deeper, for one thing. Divers cannot work at a greater depth than about a thousand feet or 300 metres. On the other hand, some subs can operate quite happily at six thousand feet or 1,830 metres. In addition, a sub can perform heavier tasks and carry heavier loads than a diver. It can work in stronger currents and for longer periods. And it can take to its working site 70 mm. cameras, video equipment, lights and water sampling gear. It would take divers many dives to take these to the ocean bed. However, there are many tasks which only divers can do. For this purpose, subs such as the Vickers VOL L1 have a pressure sphere through which divers can pass to reach the sea. The pressure of the divers’ sphere is kept equal with that of the working depth’s pressure. At the same time, the pilot and any observers carried can remain at a pressure similar to that on the surface. Most of these midget subs travel at speeds of three to five knots. There is no need for higher speeds which, in any case, would waste energy. Batteries provide the power for propelling the craft and working the equipment carried on board. These are usually of the lead-acid type. The crews breathe oxygen which is allowed to flow into the compartment at a regulated rate. Air taken from the compartment is passed through a purification system which removes the carbon dioxide. From five to ten hours is the duration of the dives of mini-subs, this variation being broad because different subs have different capabilities. But in the event of an accident, as we saw at the start of this article, the air supply can be kept flowing to keep the men inside the sub alive for several days. Successful as these mini-subs are, the designers feel that there are many ways in which they could be improved. 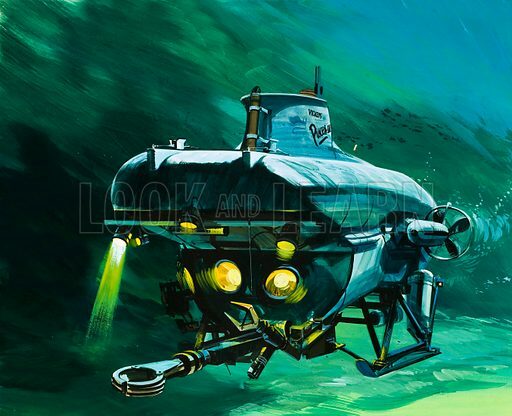 A Swedish proposal is that the mini-sub should be accompanied by a larger sub, as a mother ship. Above you can see how a mini-sub, launched by its mother ship, rescues submariners from their damaged vessel, stranded on the ocean floor. More power is also needed, and there are suggestions that this could be provided by fuel cells or nuclear energy. With these improvements, the mini-subs should be able to play an ever-increasing role in the search for oil, gas and minerals from far below the sea.